In another major breakthrough, police nabbed six drug peddlers allegedly involved in smuggling of cannabis in Tripura on Thursday. A 12-wheeler truck bearing number TR-01-AA-1741 was stopped along Tripura-Assam border. During the routine patrolling along the border area, sub inspector Sadhan Majumder and constable Nitya Das conducted search in the vehicle and found cannabis worth more than Rs 35 lakhs. According to police, there was something suspicious about the truck which prompted the two policemen to conduct thorough search. The seized cannabis weighed a total of 630 kg and was concealed in 63 packets. 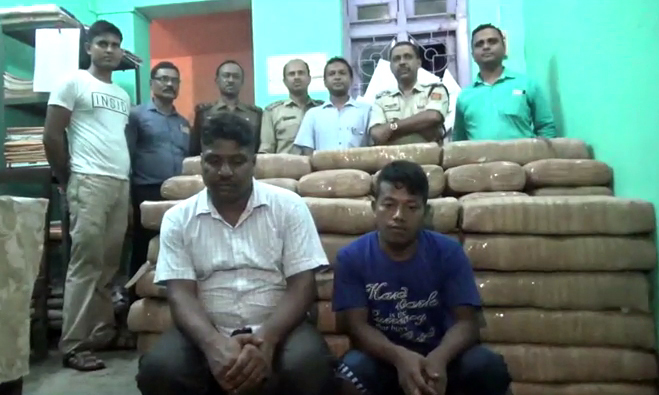 Reportedly, police have nabbed Hira Miah and Arjum Sangma in connection with smuggling of cannabis. On the other hand, in another incident police nabbed four drug peddlers allegedly involved in smuggling of cannabis. Recovery of cannabis has gone rampant across the State. Police are on the lookout for few more people involved in this crime. Meanwhile police have begun investigating into the case and intensive grilling of the arrested smugglers is going on.